The Holdsworth Firm mattress made by 5 Star Mattress in Las Vegas offers a firm feel with all of the cushioned support that you need. Designed to support the entire length of your body without creating pressure points, the Holdsworth Firm is a luxurious, economical mattress that you are sure to love. Here are just a few of the reasons you will fall in love with the Holdsworth Firm mattress, now offered by Best Mattress. The top layer of the Holdsworth Firm contains Gel Active® Foam that gently conforms to your body. Infused with microscopic gel beads, this special foam responds to your body temperature and weight, creating a comfortable experience for anyone. To keep you even more relaxed, Gel Active® Foam is also designed to promote airflow, keeping you cool at night. For even more support, the Holdsworth Firm contains HI IFD Support Foam underneath the Gel Active® Foam. 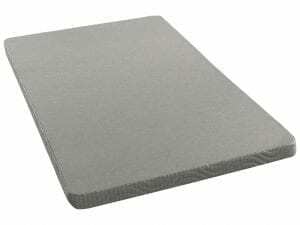 This special foam offers extra support to create more of a firm, supportive feel to your mattress. At the heart of the Holdsworth Firm mattress lies 532 Mira-Coil® Innersprings encased in foam. This feature offers an incredible amount of support, while simultaneously limiting sound and motion transfer. All Five Star Mattress sets are designed and created in the United States, which helps to stimulate the economy, create jobs, and lower emissions. With the “Made In America” seal, you can sleep a little easier knowing that your investment was created with the same stringent environmental controls that protect other products in the USA. 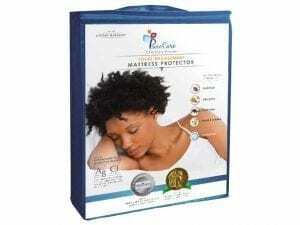 Five Star Matress sets are also designed with foams that are CertiPUR-US Certified. To become CertiPUR-US Certified, foams must be made without potentially hazardous materials such as heavy metals, ozone depleters, TCEP flame retardants, and phalates. These special foams also emit less VOCs, which helps to protect air quality. You can also sleep a little easier at night knowing that Five Star Mattresses are protected by a limited 10-year warranty that protects your investment from problems like sagging, manufacturer’s defects, and body impressions. 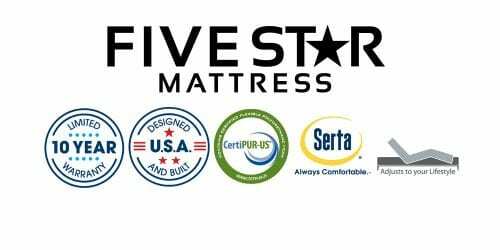 Best Mattress is proud to carry Five Star Mattress products in all of its stores. With a network of over 20 different factories across the United States, Five Star Mattress has a lower production cost and offers retailers lower shipping costs, saving you money. Their goal as a company is to offer the same great quality other manufacturer’s offer, but for less. If you need a new mattress set but you are concerned about your budget, visit a Best Mattress in your area to explore this exciting new addition to our inventory.